Our beautiful, granite fronted, self catering cottage has been designed to blend with the charming surroundings of the historic port of Charlestown. The cottage is one of a small group of seven cottages based around a central courtyard. It is 100 yards from Charlestown harbour and Charlestown's two beaches which are recommended by the Marine Conservation Society (MCS) for their excellent water quality and has European designated bathing water. Externally, Pebbledrift Cottage has the appearance of a traditional stone cottage with a small south facing gravelled and paved private court yard garden. Internally, the living accommodation is modern and contemporary with bedrooms and bath room located downstairs and open plan living accommodation on the first floor. The open plan first floor is divided into three distinct areas - a lounge area with two sofas, coffee table sideboard and TV, the dining area has a solid wood table and there is a very well equipped kitchen with breakfast bar. The kitchen is well stocked with all crockery, cutlery and utensils we think you will need. Equipment includes a fan oven with electric hob, fridge, freezer, wine fridge, toaster, microwave oven, Wifi & Broadband, Satellite TV (FREESAT), DVD player, IPod dock with MP3 aux connection, dishwasher, washing machine, hair dryer, iron and ironing board, gas central heating and combi boiler for instant hot water. Bed linen and bath/hand towels are provided for use within Pebbledrift Cottage. Please bring your own beach towels. On the ground floor there is a sunny, enclosed, private courtyard garden with table and four chairs plus two folding sun loungers. There is one marked off road private parking place available for Guest use - additional parking is also easy to find on the street or in a public car park approximately 100 yards from Pebbledrift Cottage. There will be no need to get the car out to find somewhere good to eat or drink, daytime or evening, as within easy walking distance of the cottage there are two pubs and a bar which serve food and excellent local ales, as well as a restaurant which specialises in locally caught fish, a bistro/bar and a cafe which serves breakfasts, light meals and cream teas. You can also buy delicious pasties and locally made ice creams at a nearby kiosk. There are craft shops, a gift shop and a gallery too. There is also a fascinating Shipwreck and Heritage Centre as well as the popular annual Charlestown Regatta. Charlestown is in an excellent position to explore the whole of the beautiful county of Cornwall. The coastal path walk can be picked up near the harbour. Golfers are very well catered for too - Carlyon Bay golf course, Porthpean golf course and St Austell golf course are all just minutes away. There is a sailing club at Porthpean, the next village along and, of course there is no shortage of beautiful beaches all within a short driving distance. The Eden Project and the Lost Gardens of Heligan are just a short drive away, as are the towns of Mevagissey and Fowey. Bodmin Gaol and the Bodmin & Wenford Railway are also worth a visit. There are also several private and NT stately homes and gardens in the vicinity which are well worth a visit. St Austell town is just a couple of minutes by car, has all local town amenities, including two 24 hour supermarkets. St Austell is also on the main line railway and the station is only approximately 1.75 miles away with easy connections to Plymouth, Bodmin, Truro, Penzance, St Ives and beyond. There is also a south facing, private courtyard garden. Off road parking. We live in England and are semi retired professionals. We enjoy walking, biking, surfing and general outdoor pursuits and have personally holidayed in Cornwall and in particular Charlestown for around 10 years. We love Charlestown due to it's historic setting complete with Tall Ships and original harbour & buildings, yet with a vibrant and pleasant atmosphere combining old and new. There are fine beaches within easy walking distance and plenty of local pub, bars and restaurants catering for most tastes within Charlestown itself. You don't need to get the car out for an evening out! Regatta Week (usually in July) is a special celebration with a range of traditional and modern nautically themed activities throughout the week. The property is centrally located within Cornwall with easy road, rail and air transport connections. It is ideally situated for exploring the many beaches on either Atlantic or Channel coastlines, historic country houses and gardens including the Eden project and Lost Gardens of Heligan. The facilities and amenities available within Charlestown itself make it an attractive and interesting holiday location whether for main holidays in peak season or for short breaks off season. Bathroom with bath, mixer shower, handbasin and WC. Restricted to incoming & emergency 999 calls only. Full automatic gas fired central heating. All bed linen provided on weekly basis. Linen also changed on middle Saturday for fortnightly guests. Reserved off road private parking space adjacent to the cottage. The light and airy, open plan first floor is divided into three distinct areas - a lounge area with two sofas, coffee table, sideboard, satellite TV & Wifi. The dining area has a solid wood table & chairs. Pleasant outlook from large gallery window. The kitchen is well stocked with all crockery, cutlery & utensils we think you will need. Equipment includes a fan oven with electric hob, fridge, freezer, wine fridge, toaster, microwave, washing machine. Private courtyard garden equipped with Garden Table, Chairs, Umbrella, bench seat (with storage) sun loungers and all cushions available for guest use. BBQ's (of any type) strictly NOT PERMITTED. Golfers are very well catered for too - Carlyon Bay golf course, Porthpean golf course and St Austell golf course are all just minutes away. Notes on accommodation: Strictly no pets allowed and no smoking at this property. Outside: Private south facing courtyard garden enclosed by traditional stone walls equipped with table, chairs, 2 x steamer style lounge chairs, cushions, large sun umbrella & stand & garden storage. Cleaning / Towels / Linen / Maid service: Bed linen and bath/hand towels are provided for use within Pebbledrift Cottage. Please bring your own beach towels. An excellent cottage in a unique Georgian port. We have stayed at Pebbledrift many times and always feel welcome there. The clean, well appointed cottage has private parking and is very convenient for all of Charlestown’s attractions. The Eden Project is very near, as are many other towns and Cornwall’s capital city, Truro. An excellent cottage which we hope to visit many more times. My husband, 2 kids and I had a really lovely time in Pebbledrift Cottage. We were welcomed on arrival at the cottage with fresh scones, cream and jam and appreciated the cleanliness and peacefulness of the cottage from the onset. We were very lucky with the weather and could enjoy some time down on Charlestown beach which is only a few minutes walk away and also on nearby Porthpean beach. We sampled some local mussels and Cornish beers and cheeses which were all easy to come by. 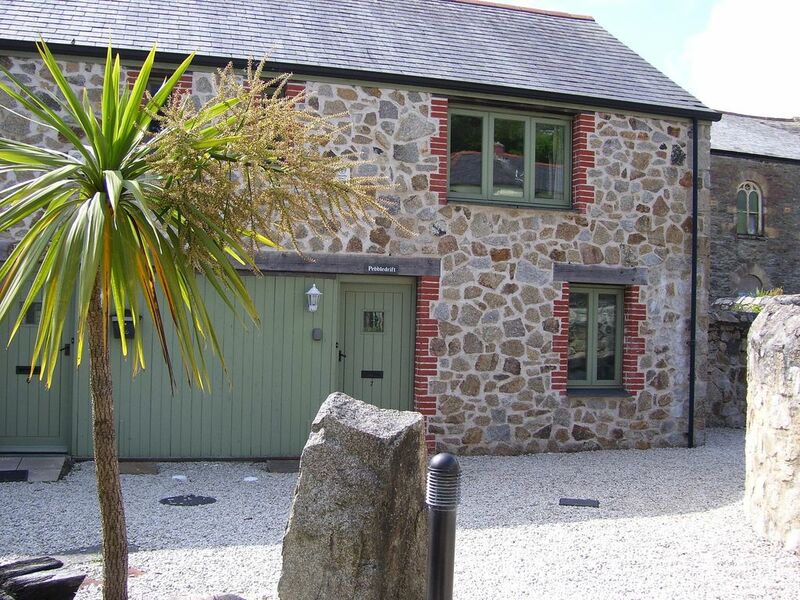 Pebbledrift Cottage is an ideal location for both the Lost Gardens of Heligan and The Eden Project, both of which were a huge success with all the family. Thank you David and Trish for welcoming us in your home. Clean, modern very well equipped in a great quiet location,with easy parking.Living room and kitchen open plan on first floor with bedrooms below, which gives wonderful light and sense of space.Would recommend and hope to stay there again in the future. Brilliant location, perfectly equipt and a beautiful tasteful decor. For anyone staying in Charlestown for the first time this is a great location. Private parking and great accommodation. All the facilities you want to make your stay a home from home. Problem is you don't want to leave once you get settled in there. We had a really great time. The beds are comfy, the upstairs open plan living space is well designed and the private courtyard at the side is great to chill with a glass of vino. loved it. We had a fantastic week in Pebbledrift - the location is great: 2 minutes walk from the harbour and the local shops, restaurants and pubs and close enough to St Austell and the main roads to get out and about. Pebbledrift itself is a great place to stay. It has been impeccably and tastefully decorated throughout - the upstairs kitchen/living area was well laid out and fully equipped (although it could get a little warm during the day). Downstairs the beds were comfortable and the shower powerful. There's a nice little private courtyard outside which is a bit of a suntrap, so perfect to relax in. All in all, we'd definitely recommend Pebbledrift. Hope you enjoy your stay as much as we did. Amazing place to call home for our half term break in cornwall with 9yr old and 4yr old. Everything you could possibly want in kitchen, including poach pods, salt, pepper, oil etc. Also thoughtful touches such as iron/ hairdryer and clotted cream and scones on arrival ! Bedrooms on ground floor so cooler than kitchen/ dining area, but everything you could need. Even outside area ... lovely bbq on one evening!! Close to 2 supermarkets and all the cornwall attractions only 30mins away. Lovely break! Pebbledrift Cottage is located within the World Heritage site approximately 100 yds from historic Charlestown harbour and a further 50-100 yds from two beaches which are recommended by the Marine Conservation Society (MCS) for their excellent water quality and has European designated bathing water. Charlestown is also located on the Coastal Path walking route. Village pubs/restaurants/cafe (2 pubs, 1 bar, 4 restaurants) with 50-200 yds. There are also various craft shops, a gift shop and a gallery within 150 yds. Shipwreck and Heritage Centre 100yds. Historic harbour and quay (usually with Tall Ships present) 100yds. 24 hr Supermarkets (including pharmacies & petrol stations)approximately 1 mile away.High street shops, banks and other services available in St Austell town centre.